The French have an undisputed passion for food (one that is paralleled by their love for all things beautiful and fashionable) and this is amply evident in the little new eatery that has opened up in the capital in Greater Kailash. Named after its chef-owner, Chef Jerome Cousin, Chez Jerome French and International Kitchen urges you to walk up two flights of stairs and enjoy a leisurely meal. The interiors: Warm, colourful and inviting, this is one space that you can relax in. Perhaps, if you are addicted to fine-dining swanky décor you may find this a tad simple for your tastes. 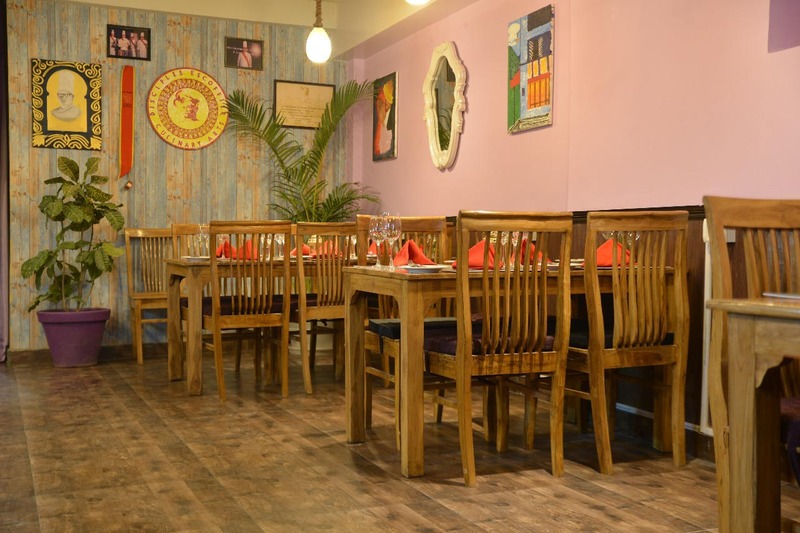 But we walk in to revel in Chez Jerome’s extremely likeable French charm – almost homely and vintage – an appeal that is enhanced by the friendly staff and amiable chef whose passion for his food is evident in what he serves and the way he talks about his journey here. We take in the lilac walls of the eatery that are adorned with paintings on whom the lights shine gently. These artistic creations bring to mind the monuments and landscapes of France. But, we would like to stress here that the setting of the meal is but a stage where the star is the chef and his food. The chef: A fourth generation master of the culinary arts, Chef Jerome Cousin has been living in India for the last decade and a half. Born in Franche-Comte to a French father and a Swiss-Italian mother, as a little boy, he was initiated in the world of flavours and got extensive grooming at the family restaurant’s even before he had reached the age of six! Interestingly, his grandfather designed utensils in a Lilliputian (well, almost) size to match the age and stature of his grandson! 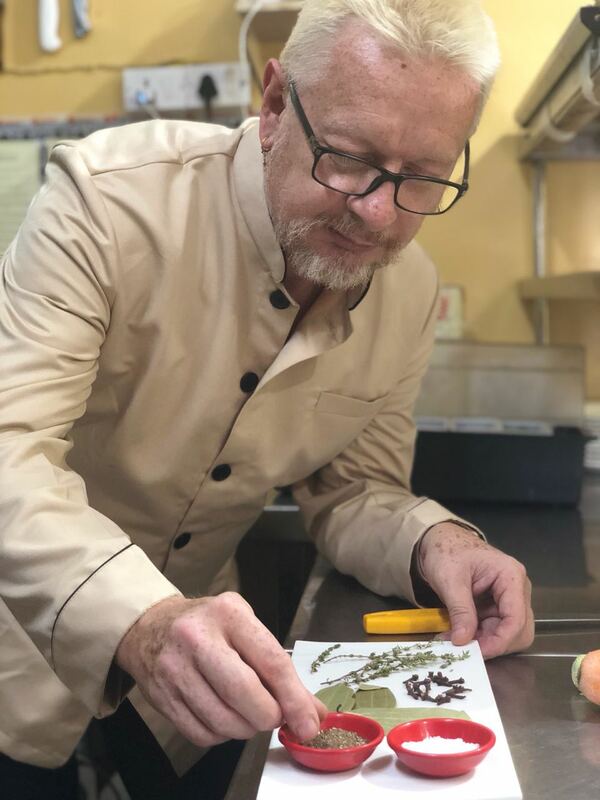 Chef Jerome’s earlier venture in New Delhi, the traditional French bistro – Rara Avis – had gained loyal followers for its authentic French home cooking with robust earthy dishes and vintage decor. Our meal at Chez Jerome on a Friday night, as unexpected showers hit the city in April, warms the cockles of our hearts – interspersed as it is with conversations with the chef, who tells us how he’s been to Chennai and Goa – but found the capital a great place to showcase his skills. The flavours: In two words, subtle and seductive. Just the way we remember authentic French food from many miles away. He serves us some classic preparations and each, thankfully reduced in size at our behest, makes us linger as we let each mouthful play with our taste buds. We begin with the classic La Gratinee (the French onion soup) that is soon followed by the Croute Au Morilles Au Porto (warm morel mushrooms, port wine reduction). Although he has offerings that have Asian flavours, we leave those for a future occasion, preferring to please our palates with the global flavours and a Duck Meat Pate with Green Pepper Corn and Brandy finds its way to our table next. 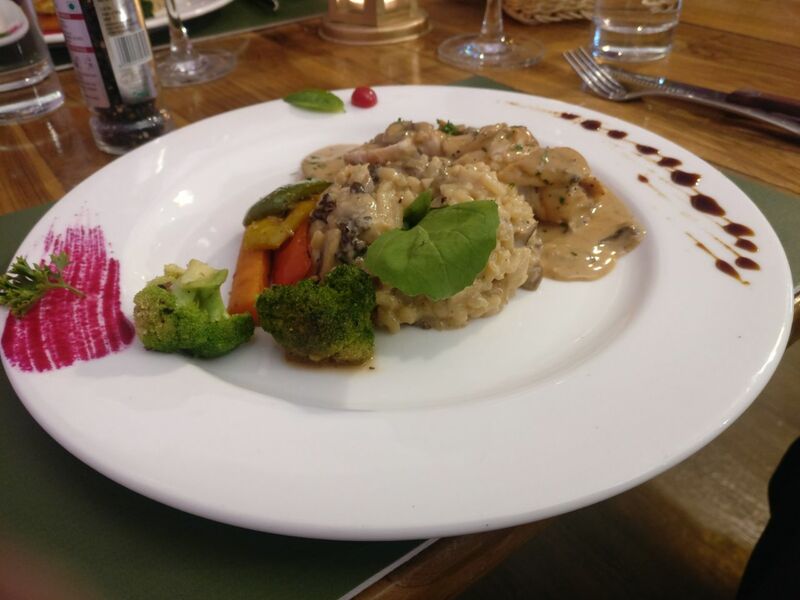 A Risotto Aux Champignons Des Bois (wild mushrooms risotto) makes us fall in love with the Italian preparation all over again. And like Simple Simon (not so simple) we metaphorically lick the platters clean. With place only for a tiny slice of dessert in our stomachs, we settle for a Caramel Custard – choosing to end our meal the way we had begun it, with a classic favourite. And lest I forget, a glass of Rose (Torres de Casta) and Red Wine (Torres Atrium Merlot) that has kept us good company through the evening. And, after bidding Au Revoir – not Adieu, mind you – to Chef Jerome – we saunter out into the streets, to find that the rains have stopped and the stars are shining forth over the capital.